Collects Mary Jane #1-4, Mary Jane: Homecoming #1-4 And Spider-Man Loves Mary Jane (2005) #1-3. Everybody loves Mary Jane Watson — so why not Spider-Man? Whether she’s in class, hanging out at the Coffee Bean or attending Homecoming, she’s always the center of attention. But is everything about Mary Jane quite what it seems? 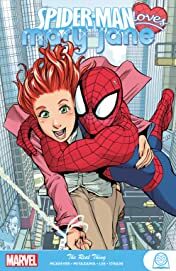 Join MJ, her best friend Liz Allan, Liz’s boyfriend Flash Thompson and their good pal Harry Osborn — not to mention a certain bookworm by the name of Peter Parker — as they experience the thrilling highs and devastating lows of high school existence! But is MJ’s crush on the web-slinger pure fantasy? Could romance lie elsewhere? The path of true love never did run smoothly! It’s a timeless story you know — from a completely fresh perspective!